Thank you for your interest in the South West Area Innovation Awards 2019. The application window is now closed. The South West Area Innovation Awards are open to all individuals, teams or organisations that operate within the South West Area of the Institute of Water which comprises of the operational areas of South West Water, Bristol Water, Wessex Water and Bournemouth Water. The shortlisted applicants will present their innovations to a panel of ’Dragons’ on Friday 8th March 2019 at WRc Swindon and the winner will be announced at a Drinks Reception the same evening. The winning entry will also be put forward for the National Innovation Awards in Belfast in June 2019. 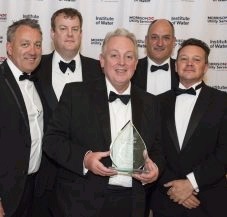 The winner is then put forward to represent the South West Area at the National Innovation Awards which will be held in Belfast on 26th June 2019.